Which Pomade Should You Get? 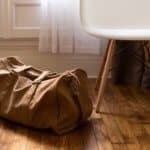 A Water or Oil Based Product? 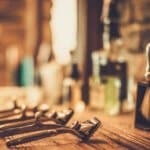 Best Pomade For Thick, Curly, Thin, or Fine Hair? 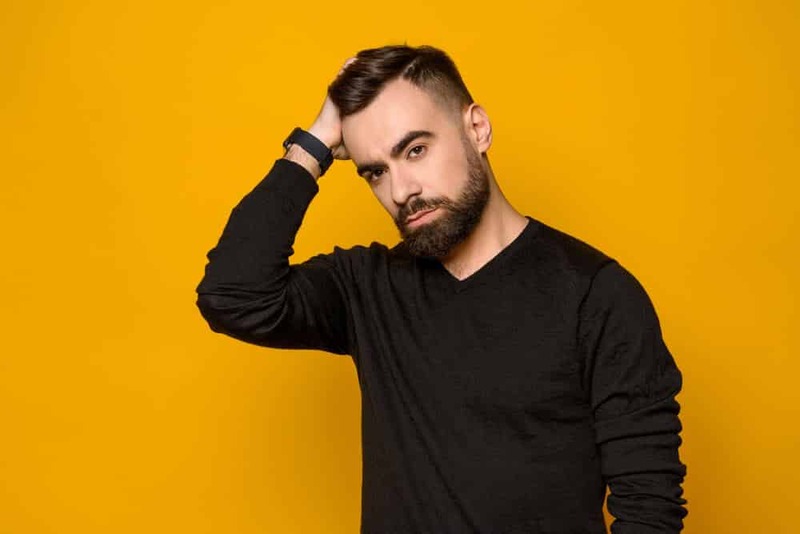 Whether you are looking to sport a newer hairstyle like the pompadour or quiff or even one that is ageless like the greasers sported decades ago, a top-notch pomade is a versatile product that can achieve a variety of looks. If there is any staple that you should have in your medicine cabinet, it should be one of the best pomades on the market. 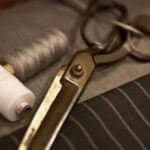 I think we all know the American Crew name by now as they’ve established themselves as a classic men’s brand that you can find in barbershops and department stores alike with their hair gels, hair clay and countless other products. Their popular pomade is well liked for giving a nice medium hold and a quiet, but refreshing natural scent. 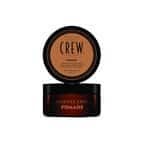 American crew is not only great for the convenience of their supply, but they’re well-known for putting out quality products and their pomade is no different. American crew says they recommend the pomade for “romantic wear,” so do what you will with that advice, but you’ll love the shine you get either way. Baxter of California brings us a quality strong-hold, paraben free, clay pomade that offers really great styling options in a rich, textured formula. For those who want more shine, use the Clay Pomade right out of the shower on wet hair. Natural ingredients like clay and beeswax allow for versatility of styling, yet still a strong manageable hold. Prefer a matte look? 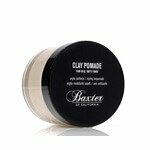 No problem, Baxter of California Clay Pomade is strong, flexible but not so dense it cannot be used to style and hold dry hair as well. The popular 2oz jar is priced fair and will work for just about any hairstyle. Bayolea is a dynamic pomade that not only gives you great molding and shaping pliability, but also adds essential moisture to your hair through its oil base. London-based Penaligon’s has been around a long, long while (since 1870 to be exact) so it is safe to say they know their stuff. 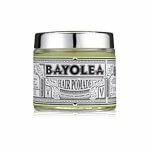 Bayloea is an invigorating citrus-piney scented pomade held in a neat looking glass jar with metal top. The hold is strong and is even beneficial in managing curls and frizz as its oil base softens hair for frustration-free styling– the shine it gives is impressive too. Talk about bang for your buck, Black & White is your economical way to head turning style. The big 7oz jar isn’t just popular for its price, it’s also loved for the results. You’ll only need to work a small amount into your hair to tame those straggling hairs that won’t stay put. 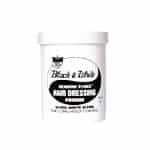 Black & White gives you hearty volume yet manageability as it allows hair strands to separate yet still shape. The heavy duty pomade is also waterproof, so go ahead, be active and feel free to share some with your best lady friend as it is recommended for both men and women. 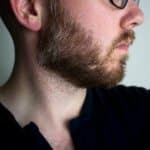 Bumble and Bumble’s Semisumo Pomade is the luxury men with medium to coarse hair are looking for. Semisumo is a blend of oil and waxes that are ideal for controlling frizz or assisting with management of more dense and course hair. Besides the excellent fragrance, Semisumo is not like some products made for dense hair that feel like a weight on your head. Just work a bit in and sculpt away as you’ll be super relieved to go about your day not feeling like you are wearing a helmet. The 1.5oz bottle is priced modestly and boasts a great shine with a softer hold and is great for color treated hair as well. 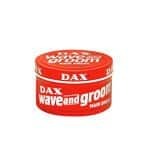 When you first get Dax Wave & Groom Hair Dress you’ll smile at the nifty vintage looking can it comes in, but what’s more important is what’s packed inside. Wave & Groom offers solid hold strength and glowing shine. The oil base will be very friendly for controlling frizz on any hair type and it has a subtle, clean scent. Wave & Groom is also preferred by those with short wavy hair because it give shape to your natural waves and cleans it up so you can work with that often difficulty wavy pattern. The 3.5 oz. can is very inexpensive and well-liked, especially by those with thick of troublesome hair patterns. Imperial’s “barber grade” products boast their Classic Pomade is America’s strongest holding water-based pomade. Being water-based offers two key benefits: smooth and even application, which allows for ease of sculpting, and quick, effortless wash out. The 6oz. jar comes at a very reasonable price, gives a super strong hold, and has a light, fruity scent (kind of like melon). The pomade is versatile as it has options for hold strength. For a light hold, apply a small amount to damp hair and style to your liking; apply a bit more to dry hair for a strong hold that still sculpts with ease. If your biggest haircare need is that eye-catching glimmer that makes everyone jealous then look no further. 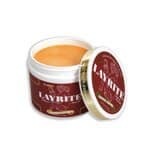 Layrite Super Shine Deluxe hangs it hat on its noticeable shine, but has other big perks like versatility with all hair styles, softening of curly, tough or frizzy hair and manageability from slicked to spiked. This one is water-based so removal is a sinch, however the hold is sturdy like a good wax. The price is reasonable for a 4oz. jar and nobody will know you saved a buck because your hair will have the polish of a fat cat millionaire. Mr. Natty Natty’s Pomade is another doozy that is targeted for the stylish go-getter. 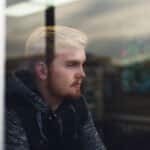 Their pomade has strong-hold wax that will keep everything in place as you rumble about, but keeps a low-shine to play of your hair’s natural color. The hold is firm but pliable and is ideal for the classic slicked back look. The 3.4oz, English-made product has a lovely floral aroma derived from violet, a fair price point and an oil base that helps with manageability. 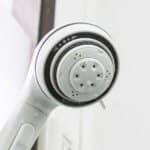 This product is not just for the slicked, heavy product users either. 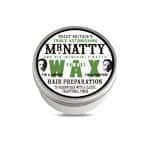 If you style dry and are just looking for better hold on your natural hair Mr. Natty Natty is for you too. 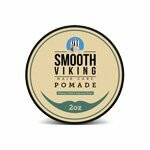 Smooth Viking Pomade is another crowd pleaser because it is really great for managing all styles and textures of hair. The medium hold keeps hair in place but feels light, and the shine is glowing and vibrant. Another water-based pomade so removal will be easy, which is really nice for those that use it on coarse hair. The scent gets mixed opinions: some rave that they love the clean, “barber shop” scent and others say it is clean but too strong. Either way, the 2oz. jar is very reasonable on the wallet and can be used wet or dry. 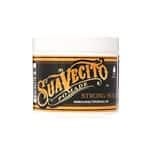 Suavecito Firme Hold comes with really solid reviews because it packs a ton of benefit into a 4oz. jar without charging an arm and a leg. First, the hold is strong, but the application is easier as this is a creamy pomade. Second, the scent is well liked for its manly touch (kind of woody and floral). Finally, it is a water-based pomade that makes for easy clean-up and carries a moderate shine. The moderate shine seems to be most popular because it is that happy medium between bone dry and just-left-the-swimming-pool wet. Benefits and style have this sleek looking jar of pomade as number one on amazon right now. 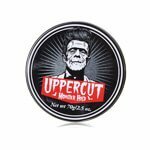 Uppercut’s Monster is meant as a metaphor for the monster, solid hold this pomade will give you. The sweat resistant, mega-hold pomade allows you to sculpt and hold in place the most difficult style and, here’s the best part, you won’t need a high-powered pressure washer to wash it out like some cheap mega-hold products; the pomade washes out with ease and you can restyle in the morning. Uppercut Monster is getting rave reviews from active men that enjoy the sweat-resistant formula and the ability to keep a slick style even when working out. Love the logo too – even Frankenstein’s monster can rock Elvis’ coif with Uppercut Monster Hold Pomade. When it comes to the construction of any pomade, men must choose between either a water or oil based product. Picking one over the other is based solely on the look you are trying to achieve along with how it will get worked into your lifestyle. 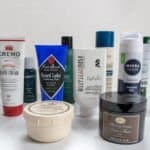 If you are looking for a pomade that will help keep your hair in check during a daily trip to the gym or simply playing a pick-up basketball game, then an oil based pomade will likely be better pick. Oil based pomades like Uppercut Monster, will keep your hair in place even if you sweat profusely. 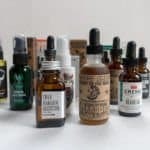 Traditionally, oil based products will take additional effort to clean fully out of your hair being that they don’t mix well with water – remember 8th grade chemistry class? On the other end of the spectrum you will have water based pomades. Pomades that use water as a base won’t provide nearly the same level of shine, but will also be relatively easy to wash out of your hair. 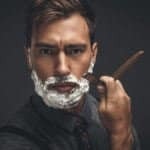 A water based pomade may be better for men who are in office environments throughout the day, or those that lead a relaxed lifestyle and simply want a low shine look. 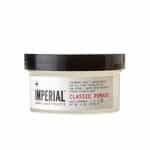 A great pick for a water based pomade would be the Imperial Classic Pomade. 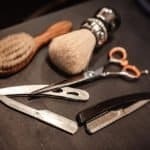 When it comes to deciding on a pomade for your hair type, its largely dependent on the style that you are going for. If you have thick, stubborn hair that doesn’t like to stay in place, then a pomade with a firm hold like Suavecito will likely be the best pomade for you. As we cover below, Suavecito is a water-based pomade that provides a medium shine and does a great job at keeping even the unruliest hairs in place throughout the day. Another great pomade for thick or curly hair types would be Baxter of California given its strong hold through the use of beeswax (which also acts as a natural protectant). For a gentler hold for thin or fine hair, then a lighter hold may be preferred like the pomade from Imperial Classic.